Two questions of definition: what is punk, and what is philosophy? In The Truth Of Revolution, Brother, the answer to the first question is mostly English, mostly from the seventies, and tending towards anarcho-punk. It's rounded out with some Americans - Jello Biafra, Steve Albini, Ian MacKaye, etc. - and a couple of intriguing Icelanders. As for what punk means, well that brings us closer to the second question. Again, the descriptive touchstones – existentialism (including Nietzsche), Zen, libertarianism and anarchism, and aversion to the idea of ‘philosophy of punk’ itself – are interesting, eclectic. Beyond the hand-wringing over -isms, however, the question should be: what is a ‘philosophy’ of anything for? The thinker who has excited me the most recently in relation to this question has been Michel Foucault, specifically the books of his public lecture series in the Collège de France – which coincidentally spanned the original punk period, from the early 1970s to 1984 (though he took a sabbatical year in ’77). His lecture courses were an exploration of the individual subject – how we constructed the truths of ourselves – though not without close attention to collective ethics. This culminated in his final two courses, before his death to AIDS, on ‘The Government of Self and Others’ (the equivalent in the book is: DIY and DIO - Do It Yourself and Do It Ourselves). The second of these, published in English in 2011 with the title The Courage of Truth, continues his fascination with the Ancient Greek concept of parrhesia (loosely translated as ‘free-spokenness’) and situates it within the philosophical movement of Cynicism – which Foucault goes to considerable lengths to rescue it from its negative valuations, seeing in it instead a positive ‘form of life’ based around a particular approach to knowledge – and social rules. 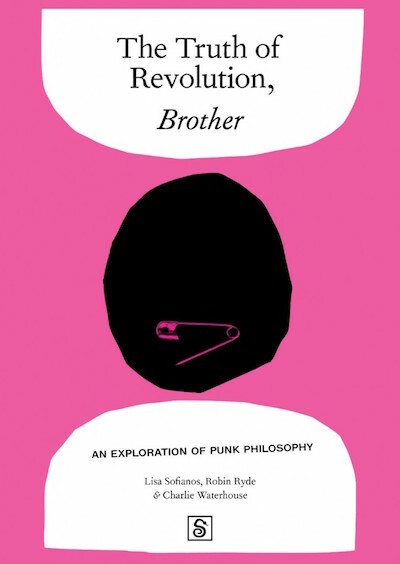 Cynicism, “the idea of a mode of life as the irruptive, violent, scandalous manifestation of the truth,” is connected by him to modern revolutionaries – and, as I would see it, to punk. Punk can be seen as negatively cynical, nihilistic, and in a large part that too is a depiction created by others - particularly by those with an interest in suppressing genuinely creative expression, as noted in many of the contributions to this book. However, it also has a positive meaning, a creative and liberating quality which is not merely libertine, which allows one to construct a new identity based on a new relationship to a community, an ethos of simultaneous self- and inter-dependence. At the core of the meaning of punk, I think, is a relationship to truth - insofar as punk sees itself above all else as speaking truth to power, or at least speaking a truth as free from power as possible (which in many Foucauldian interpretations is a grim prospect). As Penny Rimbaud, of Crass, says here, however: “Simply because Schopenhauer said something doesn’t actually give you any weight in saying something similar.” (Although the philosopher’s assertion that “boredom is nothing other than the sensation of the emptiness of existence” does have a certain Situationist – either ’68 or ’77 - ring to it.) That is, we must value our ideas by our own measures and not by social conventions, including intellectual ones. While I do get the point about the emptiness of citational chains, there is something of a pervasive distrust in ideology throughout the book that can at times tend towards a distrust in ideas. Yet it is a book of ideas – brimming full of them – and, despite itself, of ideologies. Chief among these is, of course, anarchy: that is, the absence of chiefs (or gods, or masters). An illustrative example: Steve Lake (of the band Zounds) offers the counterargument of their adult daughter who saw first-hand the mess of failed states in central Africa. But chaos is not anarchy, a point which occurs several times. My own go-to quote on this is George Orwell who, in a 1944 review criticising an overly pessimistic depiction of the possibilities of socialism, said “All revolutions are failures, but they are not all the same failure.” Actually, the first part is still very pessimistic; is it enough that all we can hope for is a variety of disappointments? The critical utopian in me says yes: that is the value of creativity and a willingness to do something – and to believe in something, which is why punk cannot simply be nihilism. Though the book does not shy away from the negative, and closes on the theme of punk’s ‘dark side’, I feel it may be lacking in truly perceptive self-criticism. The closest it gets to ‘immanent critique’ is the contribution by Pete Fender (Poison Girls, Omega Tribe) who discusses the transition from first- to second-wave punk. Though the shock energy of the first had dissipated and been “assimilated” by the media, the flowering of radical political ideas in the second also became problematic, as “one of the mechanisms by which this was achieved was the expulsion of mainstream attitudes and cultures that were considered threatening to the doctrine … Punk became isolated from any cultural background and was condemned to continual self-consumption.” Like the contemporary critiques of UK Labour in the 80s, revived today against ‘Corbynmania’, one may disagree with its accuracy or with the proffered alternatives, but in the historicisation of the movement there remains an essential diagnosis of the failure of punk.